I finally got around to reading Cixin Liu’s The Dark Forest earlier this month. My better half read it a few months ago, and I nagged him into writing a joint review with me. Well, more a conversation than a joint review. Epic spoilers ahead! Or, as Better Half says “If you’re on the no spoilers ship, better watch out, there’s rocks ahead”. He thinks he’s forgotten most of this book. He’s wrong. Here’s what we thought of Cixin Liu’s The Dark Forest. Andrea: You and I are both drawn towards character driven narratives. The Dark Forest is even less character driven than The Three Body Problem. I had a tough time getting into the story, because it was hard for me to grab onto any of these characters. Did you have a tough time too? Mike: Somewhat of a tough time, it was easier for me as I chose to read this as an historian viewing the book as ‘future history’. Then, I could just follow the ebb and tide of historical forces as the story unfolded. I liked the hope given to the Wallfacers, the unreality of the projects, and that one of them actually does save the Earth. Andrea: What’s that phrase? Necessity is the mother of invention? Humanity is desperate, so we’re willing to put our faith in crazy things. All the other Wallfacers had these ridiculously complex ideas, and the one that saves the Earth seems so simple. Talk about playing the long game! Being given limitless money and told “Save the World”, it was interesting to see what these people did with their funds and resources. Reminded me a little of the Selacao (how the hell do spell that?) from the anime Eden of the East. But the Wallfacers take advantage of their situation, they can spend money on silly stuff, and say “it’s part of the plan”. Many of the Wallfacers had a similar “ultimate plan”. Were you surprised? Mike: I also saw the Eden of the East connection, one of my favorite animes! The Wallfacers, with one exception, chose brute force methods to win a war, which is exactly what a war winner does not choose. Subtlety was only chosen by one facer, people scoffed, and he won. 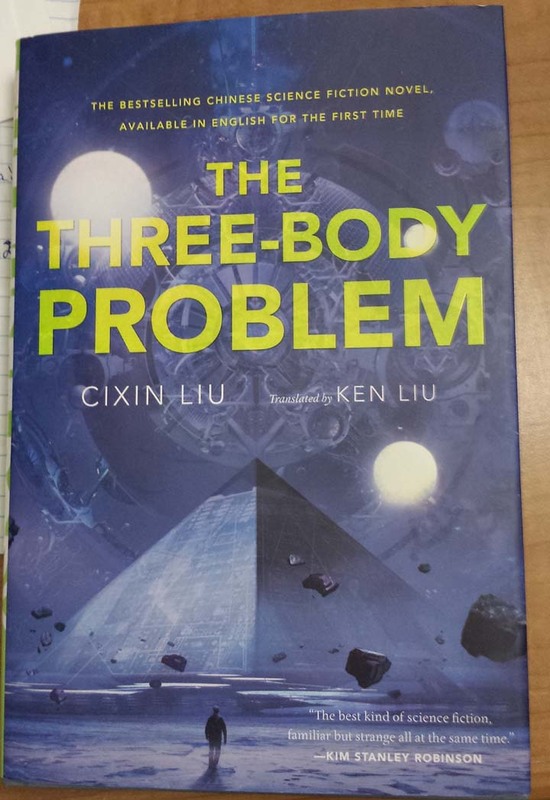 I had a very tough time getting into The Three Body Problem. In the first half of the novel, it’s hard to tell what’s going on, who or what is important to pay attention to. There are certainly interesting and important things that happen (and which are explained at the end), but I couldn’t understand how any of the dots were connected. The story starts during China’s Cultural Revolution. Professors, scientists, academics, anyone who is seen to be under the influence of western thoughts are persecuted and often psychologically tortured to the point of suicide. Ye Wenjie watches as her physicist father is murdered by teenaged Red Guards. Guilty by association, Wenjie is sent to the frontier to be politically rehabilitated through manual labor. A talented scientist herself, she is recruited to be part of the secretive Red Coast Base. It will be years before anyone is allowed to talk about what happened at Red Coast. The narrative jumps between Ye Wenjie’s life at Red Coast and modern day China, where nanomaterials researcher Wang Miao is pulled into a military investigation where he could be the key to stopping a dangerous enemy. Except no one will tell him who the enemy is, or where they are. He’s shown a list of scientists who recently committed suicide, and is exposed to a terrifying countdown that is counting down to, what exactly? Reluctantly, Wang becomes friends with Shi Qiang, the gruff police officer who had originally pulled him into the military meeting. A name on the list of dead scientists catches Wang’s attention, Yang Dong. He’s encouraged to visit Yang’s elderly mother, who turns out to be Ye Wenjie. The connection between Wang and Ye Wenjie is a point of no return. For Ye, everything she’s worked towards is coming full circle. For Wang, he learns of a video game called Three Body, in which the goal of the game (or at least the first level of it) is to predict how long the next stable and chaotic eras will be in an environment in which the laws of orbital mechanics don’t seem to make any sense. Players who understand what the game truly represents are invited to learn who made the game and why.